In order to argue that weapons research is morally wrong and, in addition, that it is morally unjustifiable, it is necessary to appeal to some system of morality. This is because it is necessary, in the first place, to understand just exactly what is at stake. When I claim that weapons research is morally wrong, what am I saying, and what does it mean to say that weapons research is morally wrong? In the second place, it is necessary to appeal to a system of morality for justification. Why is it that weapons research is morally wrong? And finally it is necessary to appeal to a system of morality to show that weapons research is not justifiable. 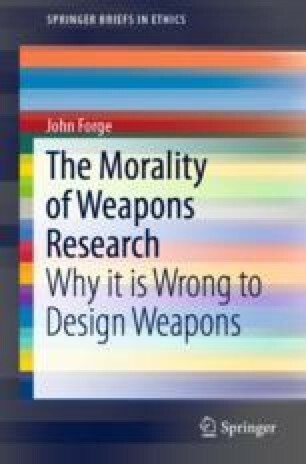 The distinction between the two claims I hope to establish in this book, that weapons research is morally wrong and that it is morally unjustifiable, is to some extent a feature of the particular moral system that I favour—as we will see, not all moral systems embody such a distinction. This raises the question as to the possibility of alternative moral systems and hence different judgements about the morality of weapons research.